For future astronauts, the process of suiting up may go something like this: Instead of climbing into a conventional, bulky, gas-pressurized suit, an astronaut may don a lightweight, stretchy garment, lined with tiny, musclelike coils. She would then plug in to a spacecraft's power supply, triggering the coils to contract and essentially shrink-wrap the garment around her body. 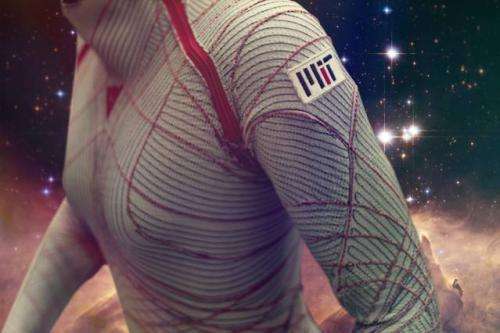 Now MIT researchers are one step closer to engineering such an active, "second-skin" spacesuit: Dava Newman, a professor of aeronautics and astronautics and engineering systems at MIT, and her colleagues have engineered active compression garments that incorporate small, springlike coils that contract in response to heat. The coils are made from a shape-memory alloy (SMA)—a type of material that "remembers" an engineered shape and, when bent or deformed, can spring back to this shape when heated. "With conventional spacesuits, you're essentially in a balloon of gas that's providing you with the necessary one-third of an atmosphere [of pressure,] to keep you alive in the vacuum of space," says Newman, who has worked for the past decade to design a form-fitting, flexible spacesuit of the future. "We want to achieve that same pressurization, but through mechanical counterpressure—applying the pressure directly to the skin, thus avoiding the gas pressure altogether. We combine passive elastics with active materials. … Ultimately, the big advantage is mobility, and a very lightweight suit for planetary exploration." To find an active material that would be most suitable for use in space, Holschuh considered 14 types of shape-changing materials—ranging from dielectric elastomers to shape-memory polymers—before settling on nickel-titanium shape-memory alloys. When trained as tightly packed, small-diameter springs, this material contracts when heated to produce a significant amount of force, given its slight mass—ideal for use in a lightweight compression garment. The group's next challenge is finding a way to keep the suit tight. 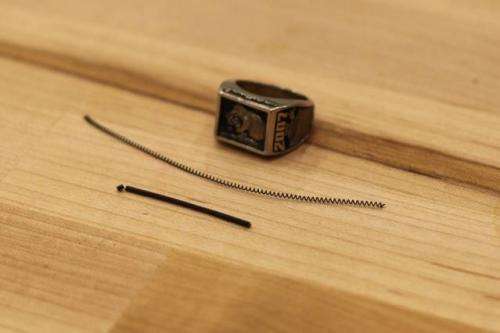 To do this, Holschuh says there are only two options: either maintaining a constant, toasty temperature, or incorporating a locking mechanism to keep the coils from loosening. The first option would overheat an astronaut and require heavy battery packs—a design that would significantly impede mobility, and is likely infeasible given the limited power resources available to astronauts in space. Holschuh and Newman are currently exploring the second option, looking into potential mechanisms to lock or clip the coils in place. As for where the coils may be threaded within a spacesuit, Holschuh is contemplating several designs. For instance, an array of coils may be incorporated into the center of a suit, with each coil attached to a thread that radiates to the suit's extremities. As the coils activate, they could pull on the attached threads—much like the strings of a puppet—to tighten and pressurize the suit. 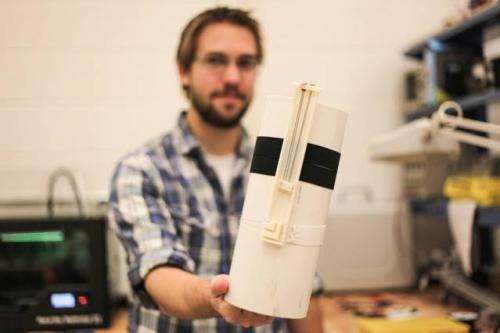 Or, smaller arrays of coils could be placed in strategic locations within a spacesuit to produce localized tension and pressure, depending on where they are needed to maintain full body compression. How would they deal with the heating and cooling needed by astronauts in space? A power pack will still be needed in any case (communications. HUD, oxygen supply, water pump, ... ) and the backpack and helmet will remain. Though the latter might be replaced with a smaller goggle/nose/mouthpiece set. A skintight suit will likely also lose most of the radiation protection capabilities afforded by old style EVA suits (which isn't much...but still). @Bradley Holschuh: instead of running the coils along the surface of the material, try sandwiching shorter, wider versions between two parallel layers, with the axis perpendicular to to the layers, so that, in the "relaxed" mode, they can expand and push the two layers apart. When heated to return to their trained shape, they will contract and draw the two layers together. If the "sandwich" is wrapped around a body, when relaxed, the springs pressure will be constrained by the top, now outer layer, or material, so the body inside the lower, now inner layer will be under pressure. To remove the sandwich, simply heat, the springs retract and the pressure is released, enabling the body to take off the sandwich. It will take some engineering to get this right, but I imagine a spring with only one or two turns, made out of a flattened strip of alloy about 5 - 10 millimeters wide and 1 millimeter thick. @Bradley Holschuh: think of chain mail made sandwiched between two layers of polymer, with short, fat springs instead of metal links. Active materials are a great idea, but this system uses heat to cause the material to contract. This is fine for a prototype, but in practice it won't be such a good idea. Where will they put their MAGs in a suit like that? And, will the suit squeeze out bodily fluids and/or prevent the MAG from functioning optimally? -One can imagine that these suits could eventually be 3D printed directly onto the skin with multiple layers for environmental control, insulation, muscle augmentation, sensory extension, power generation and storage and the like, and removed with exposure to a gas or specific EM radiation at a specific frequency, or simply peeled off robotically. When the active and passive springs provide equal force, the fabric pulls equally in both directions, but, if you make a tube or a sleeve out of the material with the active springs along the sleeve, using power to make them contract would make the tube wider and shorter, releasing the compression and essentially squeezing whatever is in, out. An astronaut would push their limb in and disconnect the power, whereupon the material would stop pushing back lenghtwise and start squeezing the limb sideways. It's basically the chinese handcuffs in reverse.